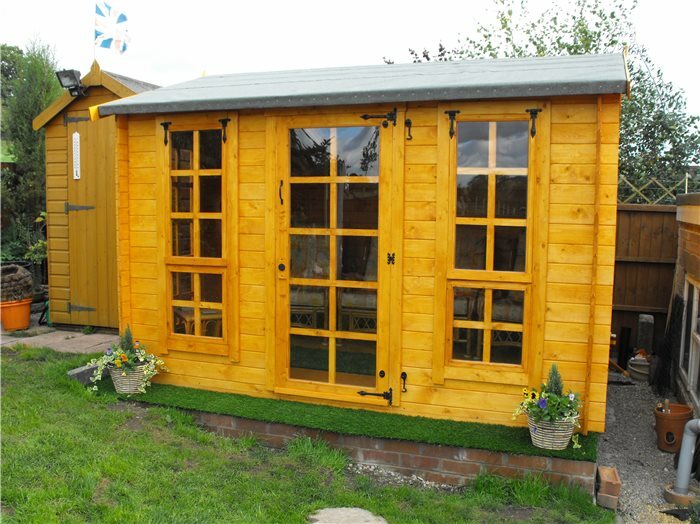 This modern designed version of a classic style log cabin further demonstrates BillyOh's growing standing as a leading manufacturer of log cabins. 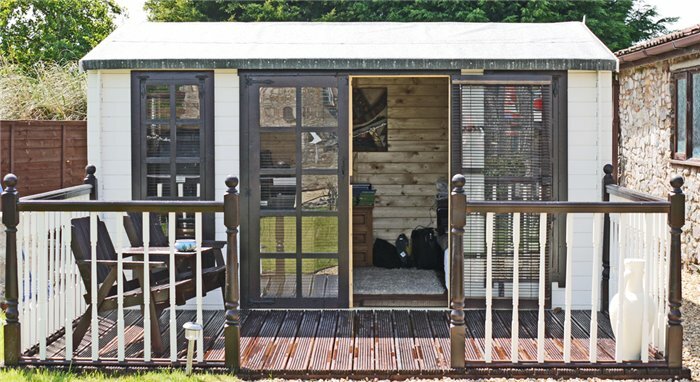 The BillyOh Pathfinder Huntsman Log Cabin is a compact yet stylish building. It has been designed with the current economic climate in mind, without compromising on quality and design aesthetics. The combination of either a single or double fully glazed door and full length windows ensure a light and airy ambiance inside. Not detracting away from the building itself, this log cabin provides generous interior space and the well crafted features such as the three full length windows which filter light into the interior adding a heightened sense of space. 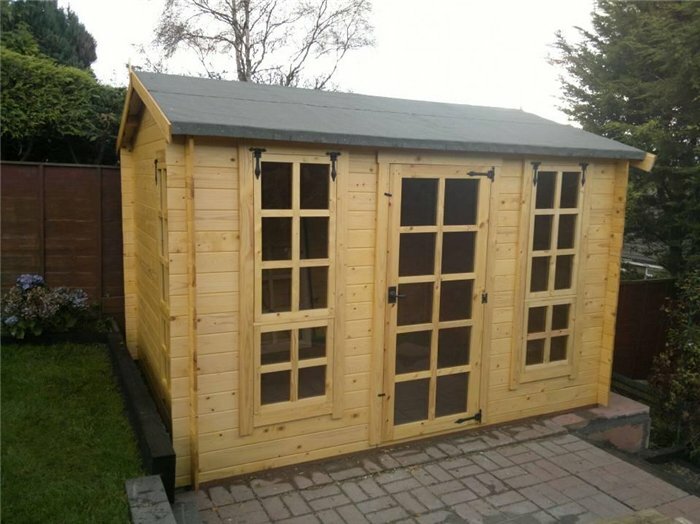 We believe this building to be a perfect garden office area away from the distractions that can be encountered when working at home, while also working perfectly as a Hobby room, den or Summerhouse with plenty of natural light. Underpinning this unique log cabin concept at this amazing price is second to none craftsmanship highlighted by the use of interlocking construction maximising the structural integrity of this 19mm cladded garden building. The cabin itself has a generous interior space and well crafted features such as the styrene glazed full length Georgian windows and doors, which allow daylight to stream in to the building, and intricate details such as antique styled handles and hinges. 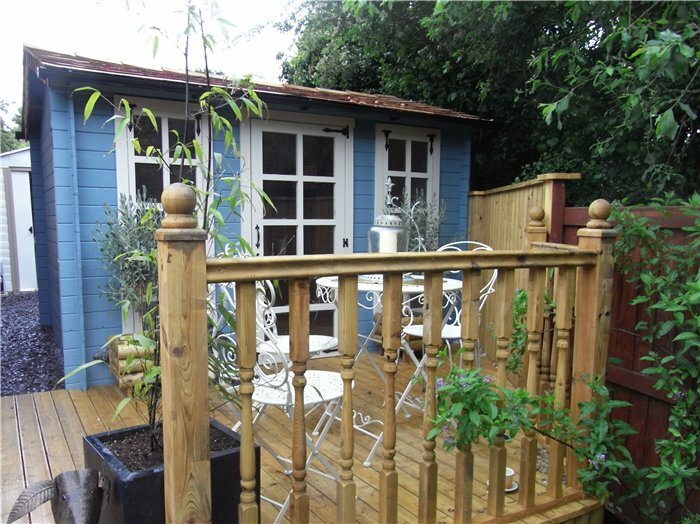 The traditional roof pitch provides a high ridge height providing plenty of head clearance for the average height adult. The Huntsman has been designed so the windows are interchangeable. This allows you to position the side window on either of the side walls. 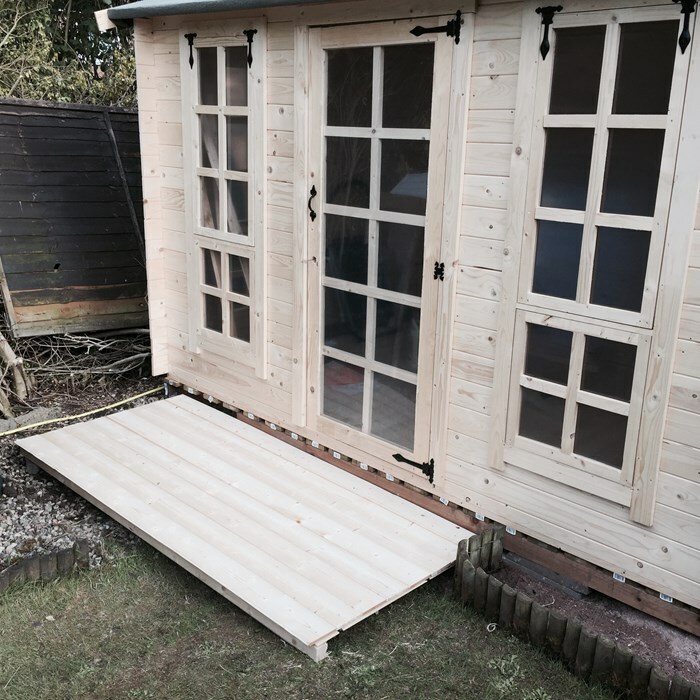 19mm Interlocking Boards - Single T&G for stability and durability. 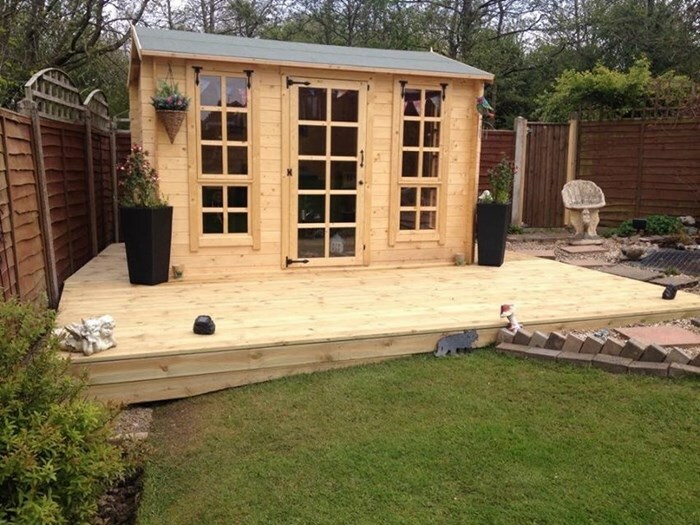 11mm T&G Floor - We Provide you with T&G floor boards, which provide a sturdy and aesthetic finish. 11mm T&G Roof - The roof is constructed using 11mm Tongue and Groove boards nailed into place on pre-cut roof purlins. Styrene Glazed Doors/Windows - There are a total of 3 windows; 1 Windows on each side and 2 windows on the front, which have a fixed bottom section and bottom opening section; all are constructed with integral Georgian styled glazing bars. Glazing comes as a single sheet for ease of assembly. Huntsman I: Fully Glazed Style Single Door - This provide plenty of light with integral Georgian glazing bars as standard. Glazing comes as a single sheet for ease of assembly. Huntsman II: Fully Glazed Style Double Door - These provide plenty of light with integral Georgian glazing bars as standard. Glazing comes as a single sheet for ease of assembly. Traditional Styled Roof Line - Roofline similar to tradtional English houses. Roofing Felt as Standard - The Pathfinder Huntsman I and II come as standard with all felt covering and fixings as standard at no extra cost. The felt used is a green mineral felt which is of higher grade than cheaper felt types such as sand felt. Designed and Made in England - The BillyOh Pathfinder Huntsman I and II have both been designed using state of the art software in the UK and manufactured in our own UK based factory. 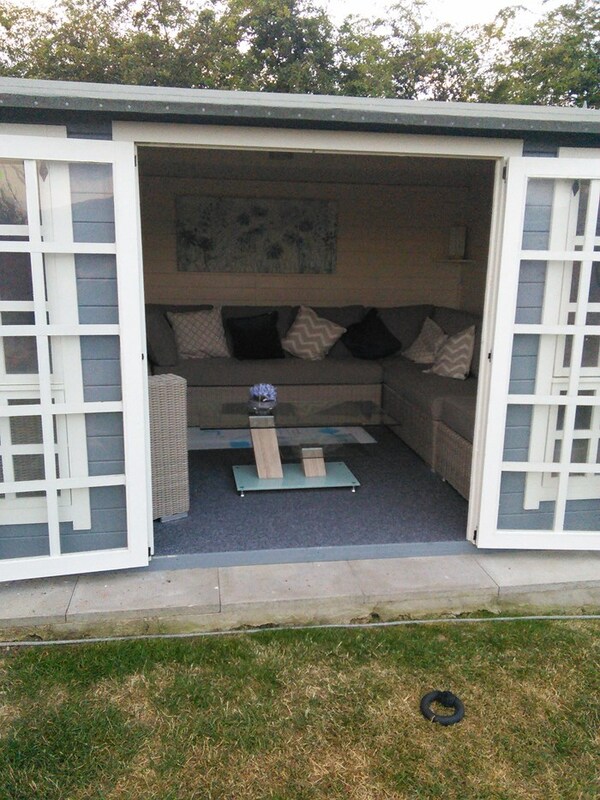 The BillyOh Huntsman I Log Cabin is an ideal building to extend your living space into your garden in a cost effective and impressive way, utilising interlocking 19mm tongue and groove timbers to fashion a strong and secure structure. 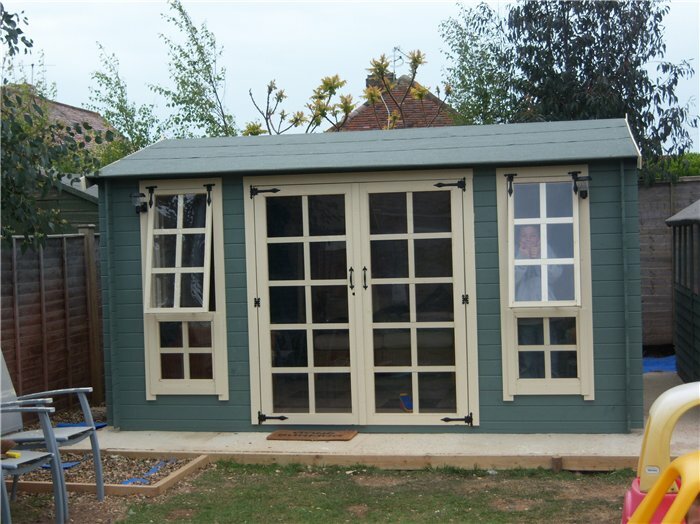 The Huntsman comes with a T&G floor and roof for a better aesthetic finish and stronger construction. Huntsman I: Overall External Building Width - Metric: 3.246m/Imperial: 10' 8" (Includes all Overhang Externals). / Huntsman II: Overall External Building Width - Metric: 3.883m/Imperial: 12' 9" (Includes all Overhang Externals). Huntsman I: Overall External Building Depth - Metric: 2.787m/Imperial: 9' 2" (Includes all Overhang Externals). / Huntsman II: Overall External Building Depth - Metric: 3.452m/Imperial: 11' 4" (Includes all Overhang Externals). Huntsman I and II: Overall External Building Ridge Height - Metric: 2.319m/Imperial: 7' 7"
Huntsman I and II: Overall External Building Eaves Height - Metric: 1.9m/Imperial: 6' 3"
Huntsman I: Internal Width - Metric: 3.022m/Imperial: 9' 11" / Huntsman II: Internal Width - Metric: 3.659m/Imperial: 12' 0"
Huntsman I: Building Internal Depth - Metric: 2.386m/Imperial: 7' 10" / Huntsman II: Building Internal Depth - Metric: 3.028m/Imperial: 9' 11"
Huntsman I: Roof Front Overhang - Metric: 0.182m/Imperial: 0' 7" / Huntsman II: Roof Front Overhang - Metric: 0.193m/Imperial: 0' 8"
Huntsman I: Door Opening Width - Metric: 0.745m/Imperial: 2' 5" / Huntsman II: Door Opening Width - Metric: 1.49m/Imperial: 4' 11"
Huntsman I and II: Door Opening Height - Metric: 1.73m/Imperial: 5' 8"
Only Huntsman I Optional Verandah Enclosed Floor Width - Metric: 3.022m/Imperial: 9' 11"
Only Huntsman I Optional Verandah Enclosed Floor Depth - Metric: 0.878m/Imperial: 2' 11"
Full Self-assembly instructions are supplied with your order along with all the required fixtures and fittings. Simply build the floor, add the surrounds and place the walls level by level to create your new building. We recommend you treat the building following construction with a high quality preservative for maximum durability. PLEASE NOTE: All dimensions stated are approximate and based on the outer external measurements of the Log Cabin. PLEASE NOTE: The Verandah option is currently only available on the Huntsman I. 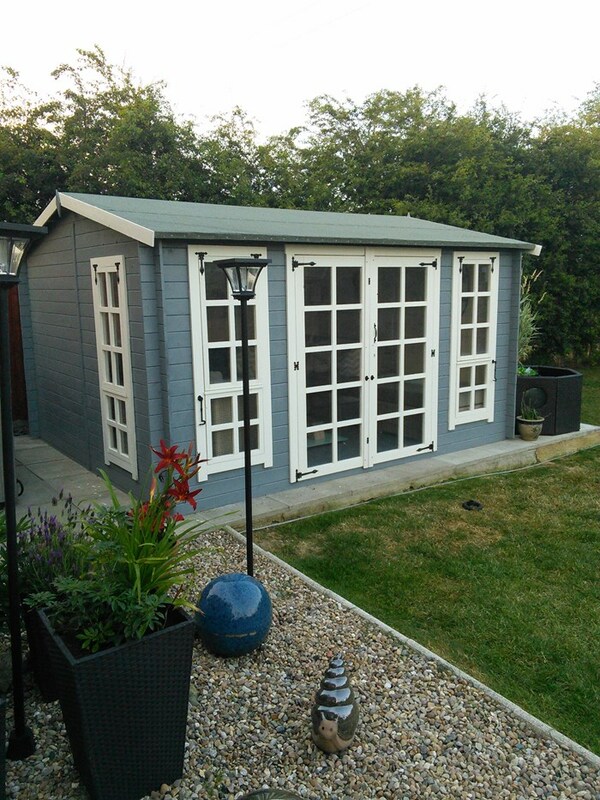 A highly versatile building, with a number of uses ranging from a classy summerhouse or perfect painting studio to a modern garden office all with plenty of natural light. Comprehensive Stage-by-Stage instructions with specific technical details. Width 324.6cm 10'8" 388.3cm 12'9"
Depth 278.7cm 9'2" 345.2cm 11'4"
Eaves Height (Inc Floor) 190cm 6'3" 190cm 6'3"
Ridge Height (Inc Floor) 231.9cm 7'7" 231.9cm 7'7"
Door Opening Size (w x h) 74.5cm x 173cm 2'5" x 5'8" 154cm x 173cm 5'1" x 5'8"
Depth (Internal) 238.6cm 7'10" 302.8cm 9'11"
Window Dimensions 42cm x 150cm 1'5" x 4'11" 42cm x 150cm 1'5" x 4'11"
Front Roof Overhang 18.15cm 7" 18.15cm 7"